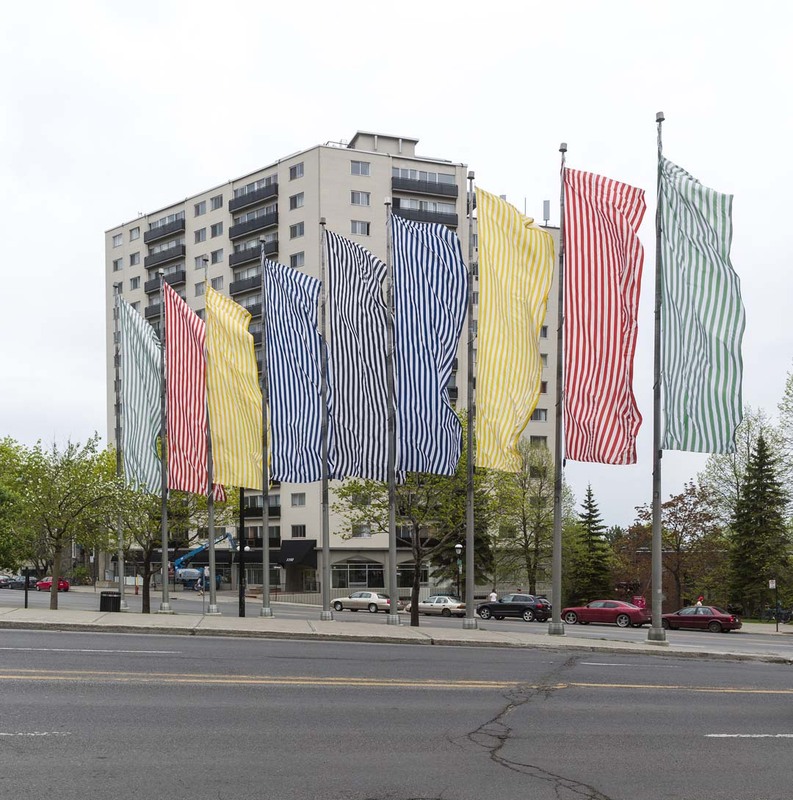 Neuf couleurs au vent is one of Buren’s first public artworks and one of the few situated in North America. 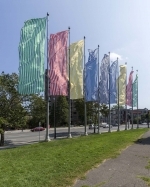 This artwork is composed of nine masts from which hang nine nine-metre-high striped banners. The coloured stripes silk-screened onto sheets of nylon are arranged in alphabetical order (in French) from the centre: vert, rouge, jaune, bleu, noir, bleu, jaune, rouge, vert (green, red, yellow, blue, black, blue yellow, red, green). 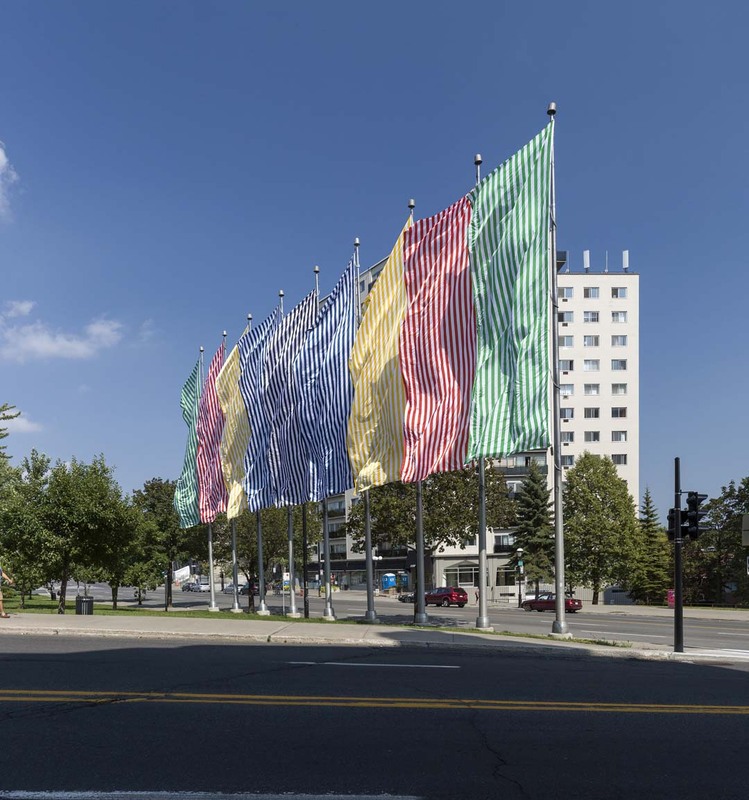 Buren created a deliberately “impersonal and objective” artwork without extrinsic symbolism or reference: the work refers only to what it is – a series of coloured flags constantly transformed by the strength of the wind. 1. Quoted in Annick Colonna-Césari, “Daniel Buren: ‘La ville est devenue mon atelier’” (interview), L'Express (22 May 2008), http://www.lexpress.fr/culture/art-plastique/daniel-buren-la-ville-est-devenue-mon-atelier_504889.html. 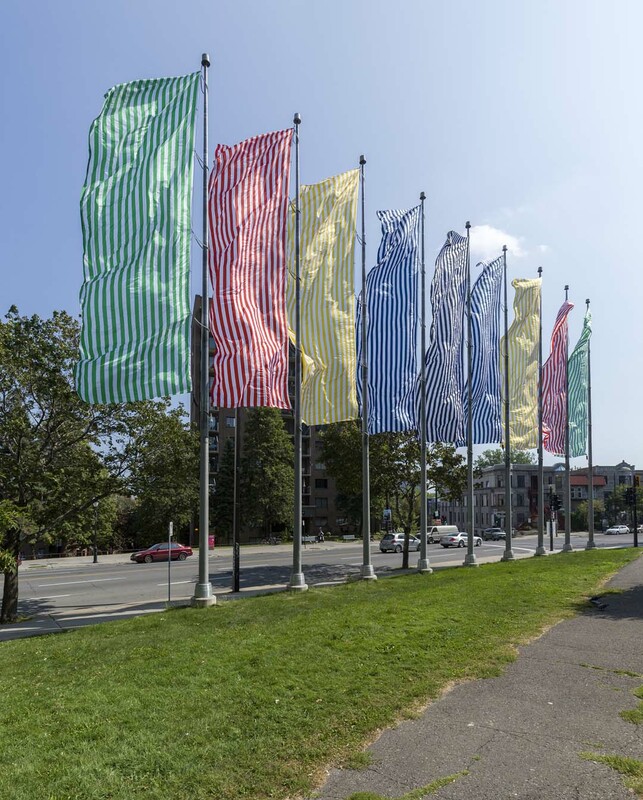 Buren’s artwork was commissioned by the Centre international d’art contemporain de Montréal and was on display in Québec City for the celebration of the 450th anniversary of Jacques Cartier’s arrival. In 1996, Neuf couleurs au vent was moved to the site in Montréal where it is now situated. 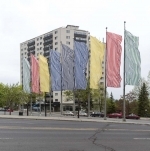 Because of the enthusiasm of residents and people in the cultural sphere, this installation, which was supposed to be temporary, became permanent when the Ville acquired the artwork in 2001. Daniel Buren is an internationally known French artist who was trained at the École nationale supérieure des métiers d’art de Paris. Coloured stripes are considered the artist’s signature. Their “neutrality” illustrates his self-referential, but contextual, conception of art. His public interventions, such as those in the court of honour at the Palais-Royal in Paris (1986) and Place des Terreaux in Lyon (1994), show how radically they can transform a site. Buren has participated numerous times in the Venice Biennale and in Documenta in Cassel. His artworks have been in hundreds of exhibitions around the world, including Le musée qui n’existait pas, presented at the Centre Georges-Pompidou in 2002.